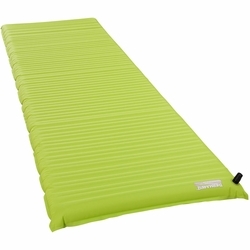 Therm-a-Rest NeoAir Venture Sleeping Pad. Therm-a-rest's patent-pending WaveCore™ construction allows the NeoAir Venture WV air mattress to offer reliable quality, performance and value for recreational campers and backpackers. The unique technology creates over one hundred insulating cells, effectively doubling the warmth of uninsulated air mattresses without the bulk, added weight or long-term durability concerns of down or synthetic fills. The Venture WV does all this with impressively low weight and the superior stability that only a Therm-a-Rest mattress can deliver. This year Therm-a-rest added the Regular Wide size for people looking for extra width without the length. Stuff sack and repair kit included.